It has been officially October for over a week and all I can think about is pumpkins, pumpkins, pumpkins. From picking the perfect pumpkin for a Jack-o-Lantern to finding armloads of mini pumpkins to place all over my house to whipping up our favorite pumpkin recipes, the orange fruit is forefront in my mind. Of all the pumpkin-related activities that you can do this fall, my favorite thing to do is make pumpkin baked goods. You all know that my absolutely, positively, #1 go-to pumpkin baked good is Mini Pumpkin Chocolate Chip Muffins, but today I’m sharing my family’s ultimate pumpkin treat. Good Old Fashion Pumpkin Bread. I always notice that around Labor Day, boxed pumpkin bread mix starts appearing on store shelves in anticipation of the holiday baking rush. As much as I love and use boxed bread/muffin/cake/brownie mix, I think that some things taste better when you make them from scratch… and this pumpkin bread is one of those things. Try it once, and you’ll be hooked (promise!). This bread has three teams of ingredients and comes together very quickly in the stand mixer. You can also use a hand mixer if that’s what you have. The first team is the dry ingredient team. Flour, sugar, baking powder, baking soda salt, cinnamon, nutmeg, and allspice. Blend those together and set aside while you get the second team together. The second team is the wet ingredient team. In the bowl of a stand mixer, combine eggs, vegetable oil, and pumpkin puree. If you have homemade pumpkin puree, you are my hero and please use it here (and can you please send me some?). I always have canned pumpkin puree in my pantry from September thru January, so that’s my go-to. Beat the eggs and pumpkin together until combined. Then, get together the third team… which is water. Yep, measure out ⅔ cup of water into a measuring cup with a spout. And now you’re ready to make pumpkin bread (and yes, I may have forgotten to take photos but it’s easy!). With the mixer on low, add in the dry ingredients and water alternately, starting and ending with the flour. Mix the batter until just combined and pour it into two greased loaf pans with a sheet of parchment on the bottom (for easy removal). All that’s left is to bake them at 350 degrees for about 45-60 minutes. All that’s left is to let it cool slightly in the pans, turn it out onto a cooling rack to cool completely, and then slice up for your family to enjoy. Or you could keep it all to yourself (I won’t judge!). So, kiddos, what’s your favorite pumpkin baked good? Preheat your oven to 350 degrees. Spray two loaf pans with cooking spray and place a rectangle of parchment paper on the bottom of each pan. An easy way to measure a piece of parchment that will fit is to outline the bottom of the loaf pan on the parchment and cut it out. 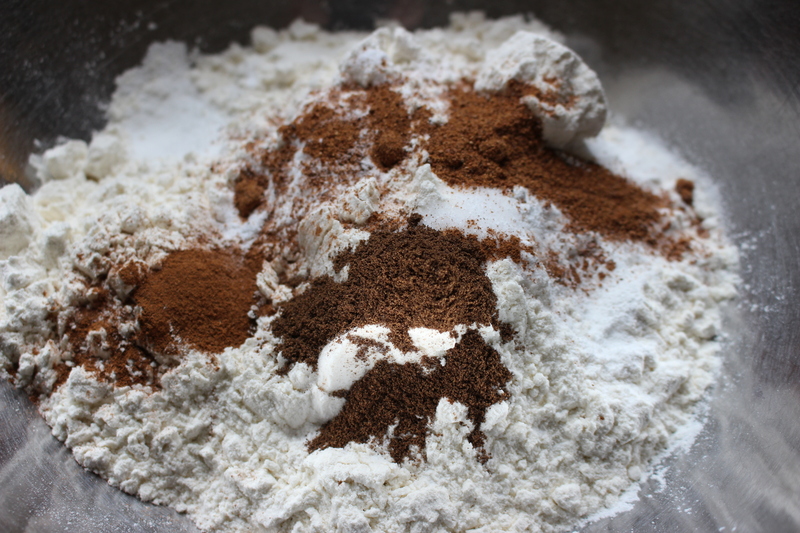 In a large bowl, combine the flour, sugar, baking soda, salt, baking powder, cinnamon, nutmeg, and allspice. Whisk to combine. Set aside. In the bowl of a stand mixer (or in a large bowl with a hand mixer), beat together eggs, vegetable oil, and pumpkin puree. With the mixer on low, add in the dry ingredients and water alternatively, starting and ending with the flour. Mix until just combined. Pour the batter into the prepared loaf pans and pop the pans into the oven. Bake for 45-50 minutes, or until a toothpick in the center of the bread comes out clean. Cool the bread in the pans for 10 minutes and then turn them out onto a cooling rack to allow them to cool completely. Happy Saturday, everyone! How was your Thanksgiving? Did anyone get mountains of snow? This year, my family and I traveled over the river, through the woods (and the snow!) to my sister’s new place for Thanksgiving. She needed to work in the afternoon, so we decided to pack up the turkey and the trimmings and head up to her place. And it was two and a half days of perfect family together time! We cooked, laughed, watched movies, and ate. We ate a lot. Our Thanksgiving dawned bright and super cold. Since my sister needed to be at work in the afternoon, we needed to eat our Thanksgiving dinner at 12:30PM. So I guess I should call it Thanksgiving lunch. We started out our day of cooking with some light breakfast fare. Some eggs, some cereal, some pineapple, and, not pictured, some amazing donuts from the shop down the street. Yum! 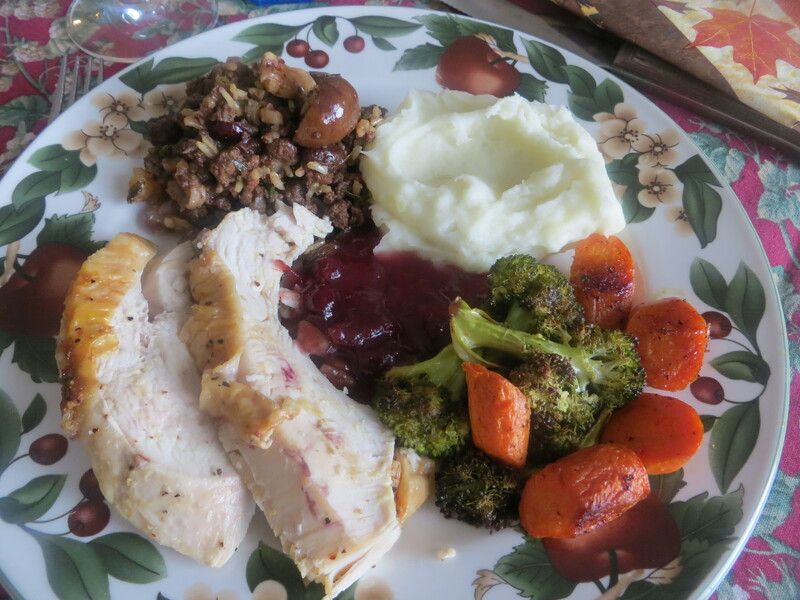 Since we did a lot of the prep of the turkey and stuffing at home, all we really needed to do was roast some vegetables, mash some potatoes, and make the cranberry sauce. E took this one (and was a good sport in my quest to grab a decent photo of everything). Who knew that standing on couches allowed you to get pretty good aerial table shots? But when all is said and done, Thanksgiving is about two things – food and family. The only thing better than sitting down to marinated turkey breast, Greek rice and chestnut stuffing, roasted vegetables, and creamy mashed potatoes (and a small lake of cranberry sauce) is sitting down to a wonderful plate of food surrounded by people you love (especially my sister… it’s still so weird not having her in the house all the time!). 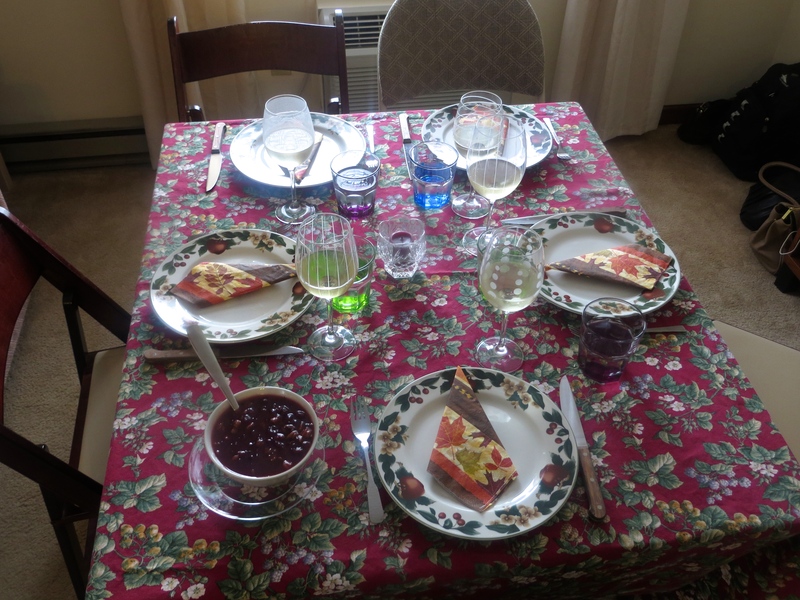 I hope you had a wonderful Thanksgiving, full of food, family, and friends… I know I did! Happy Thanksgiving, everyone! Wishing you and your family and friends a wonderful holiday full of food, laughter, and a time to gather together and give thanks! And I have so much to be thankful for! Like my wonderful family and friends. Who I know is thankful for a warm place to nap, the impending turkey dinner, chasing a piece of string, and our endless streams of one-sided conversation (okay, maybe not the last one). I am thankful for the opportunity to be in a challenging dietetic internship which is bringing me one step towards being an RD2Be. … which allow me to break out the boots and jacket for a post-breakfast walk. And I am so, so thankful for YOU! This blog could not be possible with all your love, support, and comments. So much to be thankful for this year! So, what are you up to this Turkey Day? I would love to hear it!